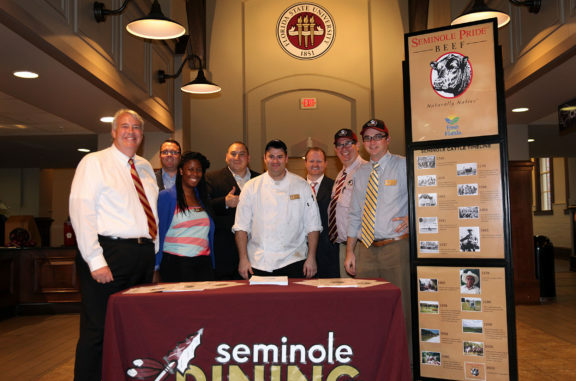 Seminole Pride Beef makes FSU debut | Seminole Tribe of Florida, Inc.
TALLAHASSEE — Florida State’s homecoming weekend wasn’t only about football, parades and princesses; it also marked the debut of Seminole Pride Beef on the menu for students at the Suwannee Room dining hall Oct. 14. 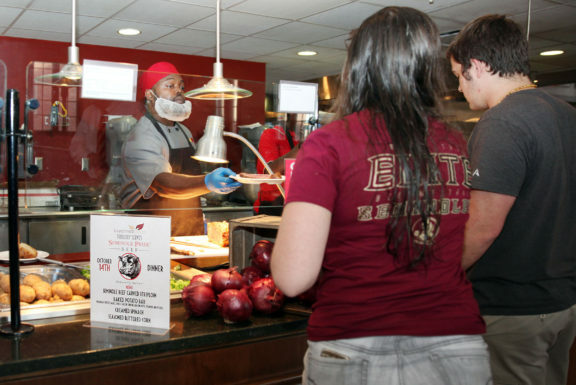 It wasn’t the first time Seminole Pride Beef has been featured on campus; the brand has been supplying beef to athletes in their dining room for about a month. There are three dining halls plus 29 restaurants on campus. The Suwanee Room, which serves about 21,000 meals per week, offers a large variety of food choices but steak isn’t normally on the menu. Michael Sauceda, Seminole Pride Beef director of business development, provided about 220 pounds of beef striploin for the debut. “This is the beginning of a relationship with student meals,” Sauceda said. 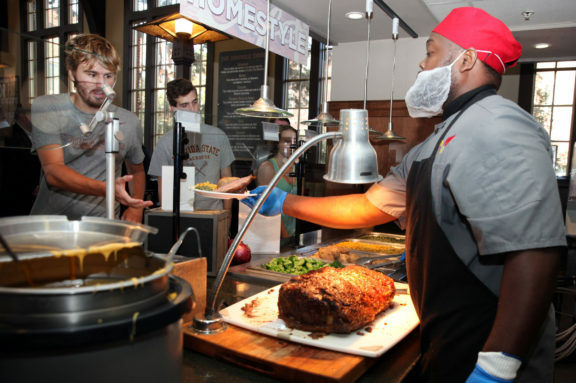 Students began lining up at 4:30 p.m. for their steak dinner with all the trimmings including a baked potato bar, vegetables and freshly baked rolls and desserts. Students clearly enjoyed the unexpected treat. A generous portion of hand-carved beef filled the plate, leaving little room for the side dishes.